I'm amazed with how much LinkedIn was able to accomplish to this day. It's beyond amazing! The guys over there have built an incredible social network that's so powerful that it deserves a huge amount of respect from all of us. I mean sure, there are people who will spam you from time to time, offer you some fake nonsense and try to close you in a poor way, but hey, that's normal. Any place that gets crowded with marketers is eventually doomed. We, los marketers, ruin everything. But that's what makes LinkedIn an even greater opportunity. Especially if you're operating in a B2B environment. When others are not being able to close deals, that leaves you with an open shot from downtown. 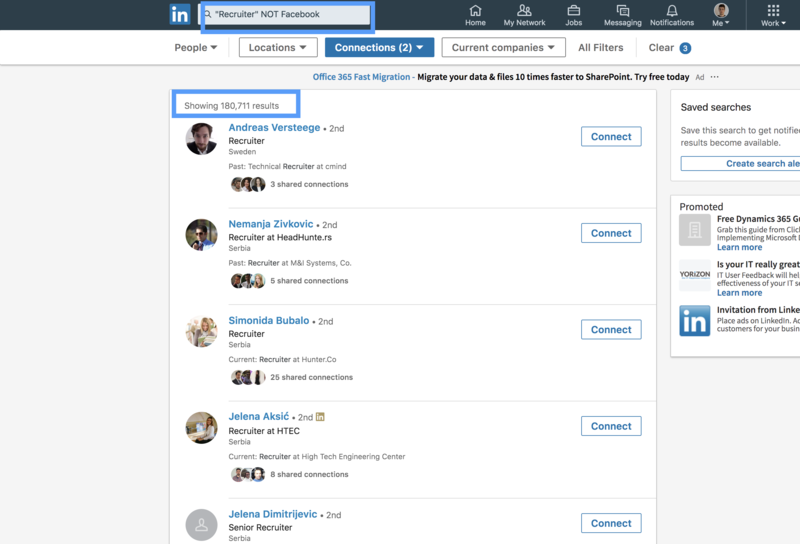 You can learn a lot about your prospects and the company you're reaching out to on LinkedIn. You can quickly find the ideal person to get in touch with and avoid wasting time on a wrong audience. Whether you're pilling up your next outreach list or looking for a person to hire, it's ridiculous how much speed you can bring to your team's process. And I'm talking both in quantitative and qualitative terms. 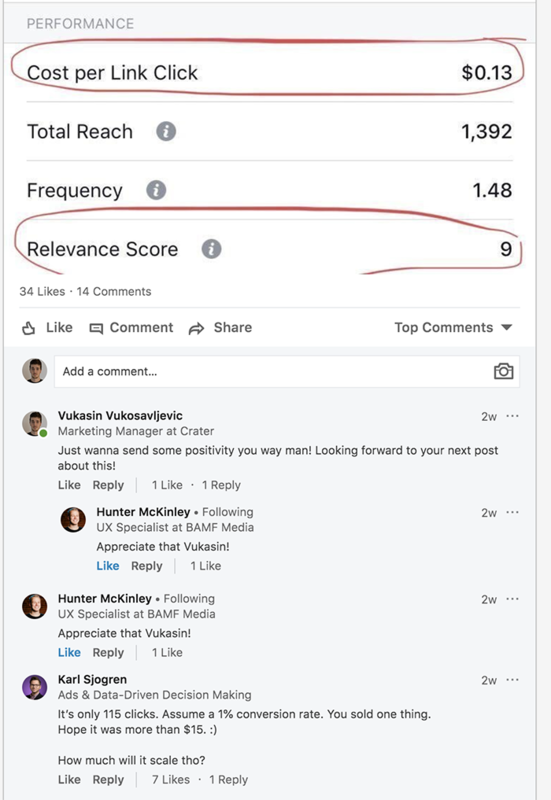 I've read a lot of stuff on how businesses use LinkedIn to grow their business. I've also had the luxury to witness the action firsthand and have learned a thing or two down the road. Today, I'd like to share these lessons! 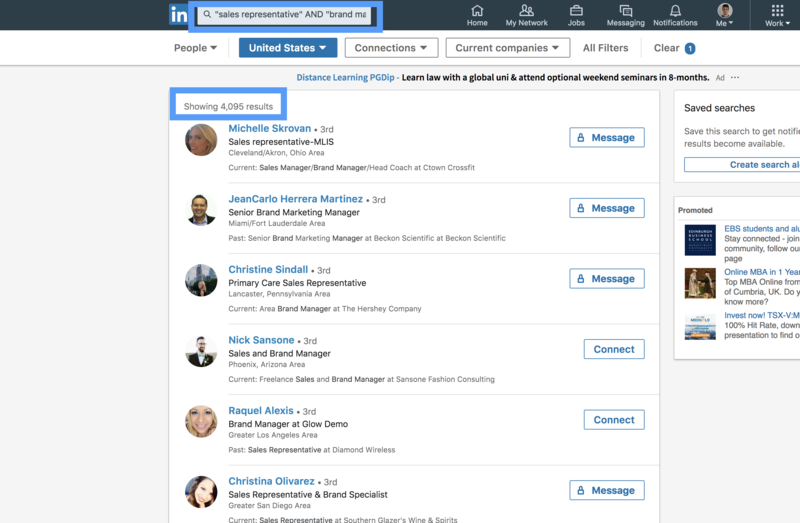 And I've narrowed down my search by filtering out 2nd and 3rd level connections, along with marking the "Marketing & Advertising" industry field. The result is 2,163 prospects. In exactly the same way you can leverage "AND" and "NOT" searches as well. For instance, you wanna explore Sales Representatives who also worked/are working as Brand Managers in the United States. Easy! Or you might wanna browse through HR Recruiters who don't work at Facebook. How can you perform these kind of searches? Search any term or position you want while writting OR, AND, and NOT with caps lock on. Here are the searches I did in the above examples. Remember, if you're using parenthesis like I did, it means that LinkedIn will pull out searches that contain that exact search term you wrote. 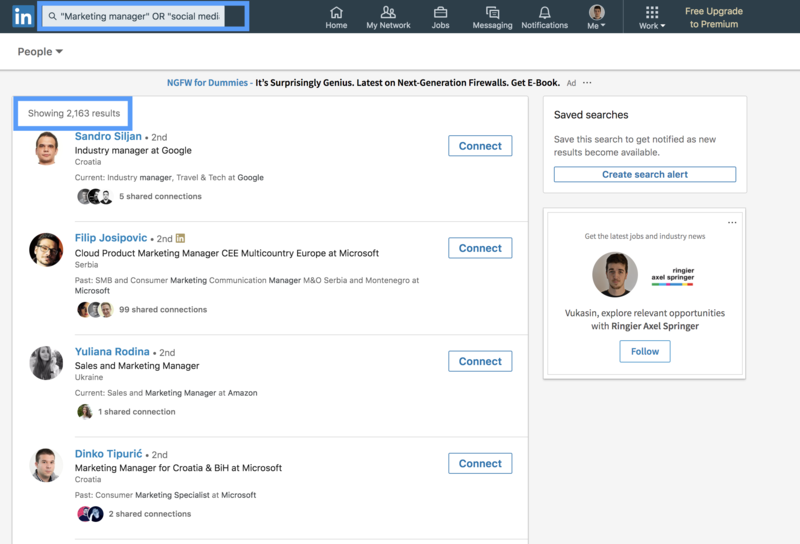 "Marketing Manager" OR "Social Media Specialist"
"Sales Representative" AND "Brand Manager"
Use filters to narrow down and conquer your niche. I'm a content guy and my main job is to produce and distribute content. One of the ways to distribute is to nurture two-way relationships with people from your industry and beyond. Now let me be clear, I'm not talking about manipulation. The "I'll do this now with the expectation to get what I want a week later" approach. I'm not against doing favors, but I'm against being a cold-blooded manipulator. You ought to be doing this for the right reasons because people can smell your B.S. It's just the matter of time. Anyway, I've digressed. Here's my $0.02 with comments. Be kind to your network. Somebody published out a new blog article? Excellent, comment on it and leave your opinion. A person you know is looking to hire a full stacked dev, help them by sharing their job ad on your feed if you have a lot of devs in your network. Like, be kind ... for real. It's hypocrisy when you're expecting that from others without you executing on it first. When it comes to meeting people and prospecting, I like to do the following. For example, I'm a huge Gary Vaynerchuk fan. From time to time, I love to go through his comments and join the conversation. Maybe exchange a few personal messages as well. I've been doing this on Instagram as well. Might even ask someone how he or she did something I fancy. It's how relationships are made. 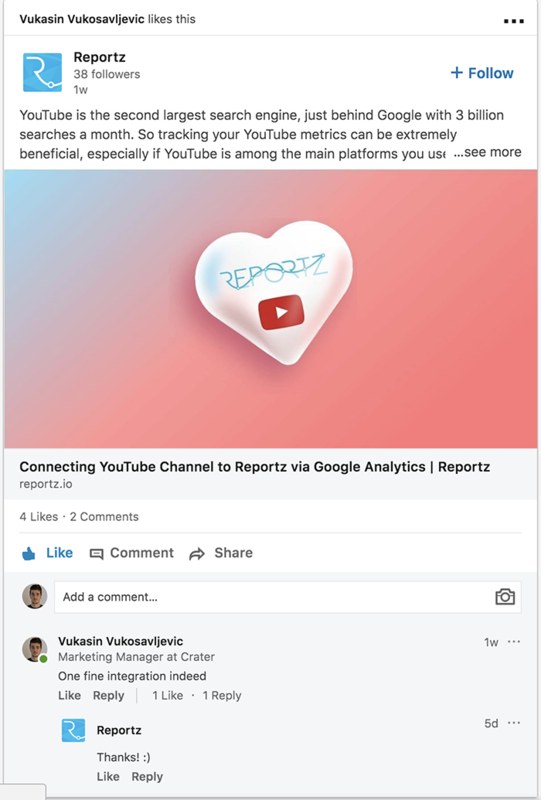 Sure, you can go through comments and build a prospecting list out of it. You do you! If it works, I'm happy for you. The logic behind this is that Gary has such a loyal following with whom I share something in common. Plus, the engagement on his posts is huge. There are many Gary-s out there in every industry. And again, even if there are 10 responses (or zero) in a single post that doesn't mean you can't contribute and do something with it. Just do it for the right reasons, and if something comes from it, cool, consider it as a Christmas bonus. It's not just about prospects. Never EVER forget your clients, regardless of their size, revenue contribution or potential. I pity people who make this mistake and definitely load the ones who's actions don't match their words one bit. Anyway, a super slick LinkedIn trick is to utilize it to take care of your clients. It can be as simple as logging in to see if the person using your service got promoted or if their company won some kind of an award or recognition. Even if it's a 3-year work anniversary, leveraging these notifications can go a long way. For example, send a message congratulating them, but craft that message with care. Give that prospect a gift or a super crazy discount. Send a box of cupcakes to their office. It's the gesture that matters. Give without expectations. And then give some more. Spam alert! Don't just join and share your content. Unless you're Rand Fishkin and you've created a new "Whiteboard Friday", it's not going to work. Plus, you'll get banned, as you should! Do Skills & Endorsements Make Sense? My final tip, skills and endorsements. When you're all about making your prospect list bigger, this can be a smooth move to make. Me personally, I don't really care about them that much. I'm sure they have their use, but again, I don't care. Let me know if any of these work and definitely comment if you have your own moves. Gonna read 'em for sure!